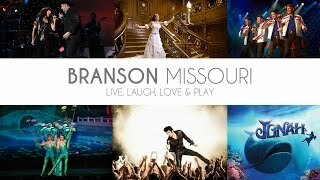 With dozens of venues, more than 100 shows from which to choose, and performances in the morning, afternoon, and evening in a variety of state-of-the-art theaters, Branson easily earns its reputation as the live entertainment capital! Venues range from intimate showrooms to indoor theatrical palaces. Branson shows appeal to visitors of all ages; you'll find music from nearly every genre performed by rising young entertainers as well as legendary artists. From popular homegrown Branson stars like the Presleys with their country/variety music jubilee, to the breathtaking feats of the Acrobats of China, to the best of the best in tribute artists at Legends In Concert...you're sure to find your favorite style of entertainment in Branson, Missouri! No other destination in the country offers so many live entertainment options; many shows appear season after season, year after year, and many theaters play host to visiting artists for one-night-only appearances...a single annual visit just isn't enough to enjoy all the entertainment Branson has to offer!